fire outbreak - (Google photo). A newly-wedded woman has set her husband and herself ablaze over alleged infidelity in Kano state. She accused her husband of infidelity shortly after she overheard a conversation between him and an unidentified lady on the telephone. 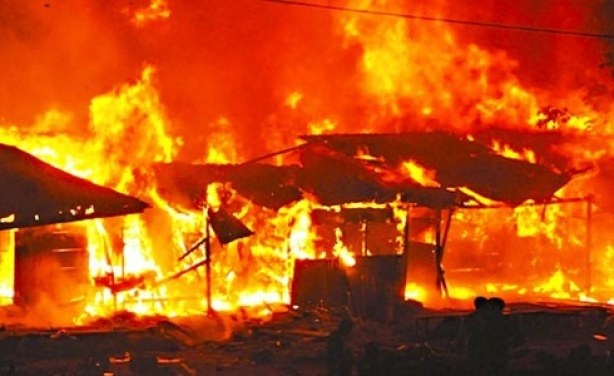 The next line of action she took is what is baffling residents as she was said to have lit a keg of petrol in their No 54 Middle Road residence in the Sabon Gari area of the city, which exploded and engulfed her and the husband. The husband, who did not die on the spot, was rushed to a nearby hospital for medical attention where he later died. It was learnt the woman accused her husband of infidelity shortly after she overheard a conversation between him and an unidentified lady on the telephone. She reportedly got angry and lit a keg of petrol which exploded and engulfed their home at about 12am on Tuesday. Eyewitnesses disclosed that the wife, who was burnt beyond recognition, died at the scene of the incident, while her husband later died at an undisclosed hospital, where he was rushed to after receiving first aid at Fortress Hospital at Sarki Yaki within the metropolis. Another eyewitness, Emmanuel Okorie, who simply identified the late husband as Emeka, disclosed that the couple hailed from Anambra State. He said the late couple got married about five weeks ago. He said the woman whose pregnancy was about seven-months-old, joined the husband in Kano three weeks later. Kano State Police Command, DSP Musa Majiya, said detectives from the Command had commenced an investigation into the incident.